A few weeks ago, Diablo III Community Manager Vaeflare reached out to me to do a Q&A session for the “Fan Creation of the Week“. 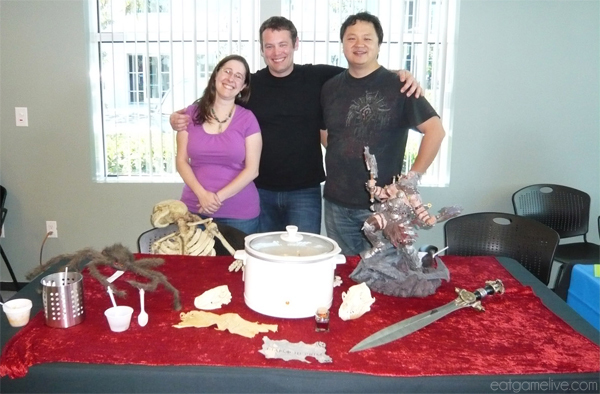 I was trilled to be featured in one of the blog posts, but I had questions of my own… Specifically, I wanted to know what sort of Diablo-themed dishes the Diablo III team wanted me to create! To make sure that this recipe was delicious, I sent the recipe over to the PTR (public tasting realm) over at Blizzard. Here, this recipe would be put to the test. MMM….FRESH MEAT. A view from Wyatt’s kitchen the night before the feast. During lunch on a quiet Wednesday afternoon, Wyatt unleashed the behemoth feast upon the Blizzard campus. 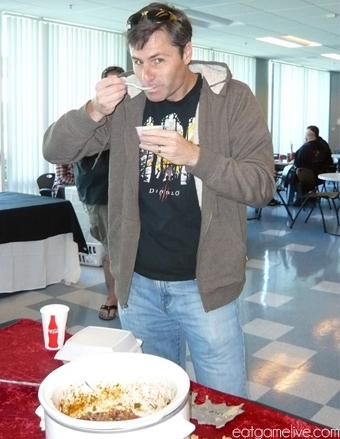 Chili samples for everyone!! Awwww yeeeeaaaaah! Food tastes better when you’ve got ambiance! Use the sword to keep other people away from your food. Chili is not account bound. Folks from all departments, including the Diablo III development team, the eSports department, Community Development, and more, gathered ’round to feast! Wyatt Cheng looks on as nom nom nomming occurs. 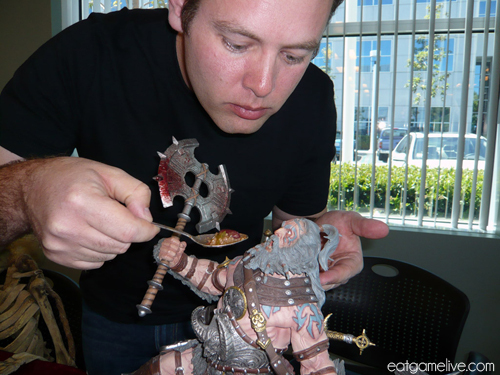 Kevin Martens, Lead Designer, Diablo III, carefully feeds a Barbarian. Don’t Whirlwind on an empty stomach. 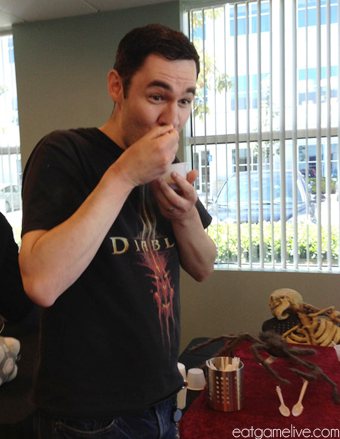 Overall, it seems like Diablo III Chili was a success in Blizzard HQ! 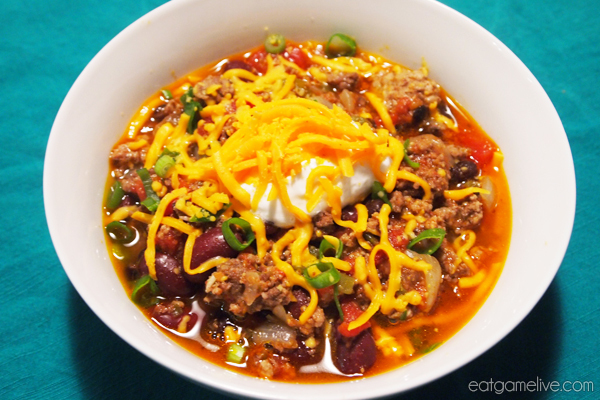 Now it’s your turn to embark on your own delicious and diabolical chili-themed adventure. Let’s get cooking! 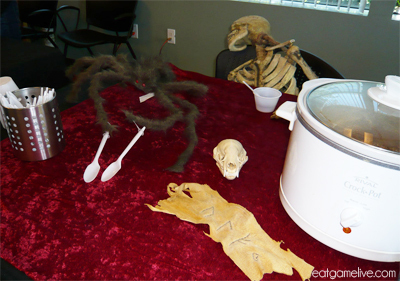 Lots of chili consumed at Blizz HQ. WARNING: DO NOT CHOP HABANERO PEPPERS WITH YOUR BARE HANDS!! Use gloves or chop in a food processor. The oils from the pepper (capsacin) will burn your hands!! 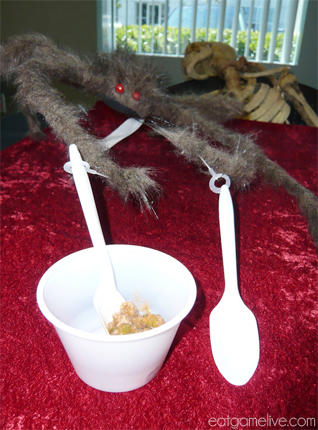 A friendly spider enjoys some chili and warns you of the hazards of capsacin. 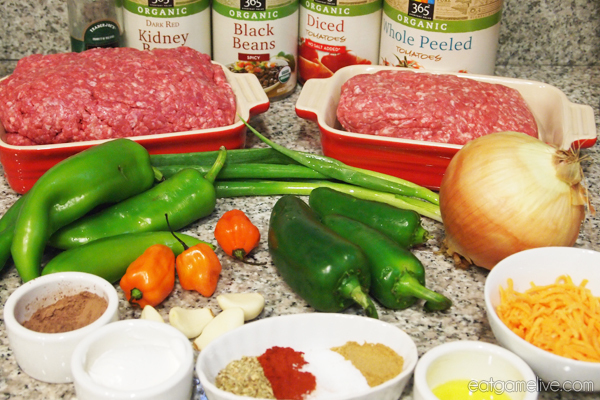 I will note that the amount of ingredients above will make a ton of chili — so be prepared to share! You can always put left-over chili in ziplock bags and place them in the freezer for later use. Total prep time is about 30 minutes. Total cook time is about 1 hour. This will make 8 servings. 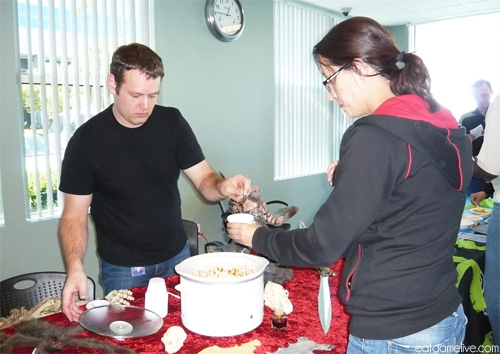 Kevin Martens serves up some chili! Set a large pot on high heat. Add in half of your oil. When the pot becomes hot, saute your onions and garlic. Remove the garlic and onions when the onions become translucent. Add in your remaining oil and add your ground beef and pork. Season with half of your salt, pepper, cumin, cayenne, and paprika. Allow ground beef and pork to brown in the pot. 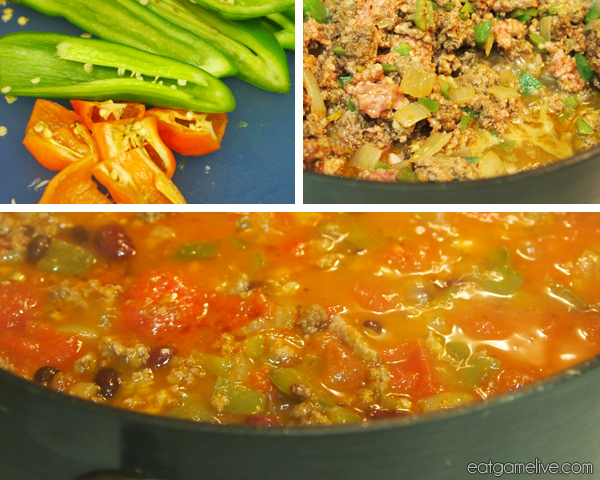 Reduce heat to low and add in your diced and whole tomatoes. Return your garlic and onions to the pot. Add in remaining salt, pepper, cumin, cayenne, paprika, oregano and chocolate powder. Add in your chopped anaheim, habanero, and jalapeño peppers. Add in your strained kidney and black beans. 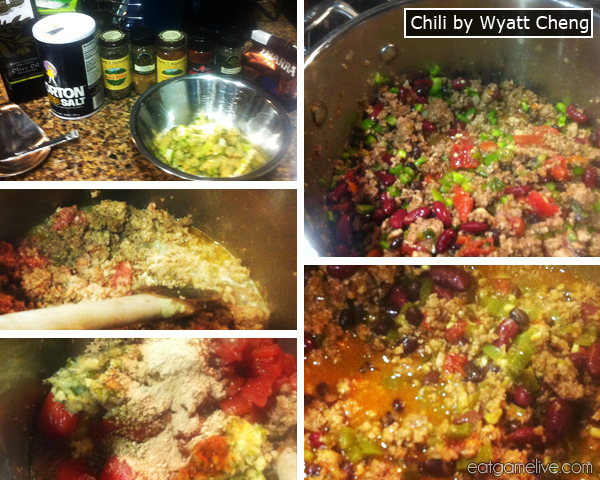 Allow the chili to simmer for about an hour, stirring occasionally to prevent the bottom from burning. Garnish with green onions, sour cream and cheddar cheese. And that’s a GG WP for Diablo III Chili! 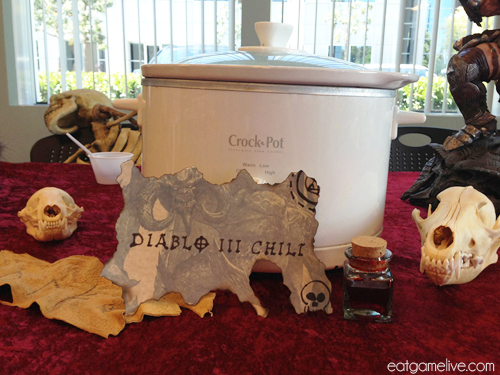 Try out this chili while you barrel through Act II on the quest for Demonic Essences. 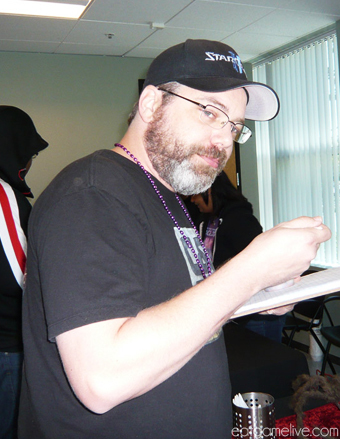 Jason Regier, Technical Director, Diablo III, (left) and David Pendergrast, Senior Gameplay Engineer, Diablo III, (right) put on their best chili eating faces. 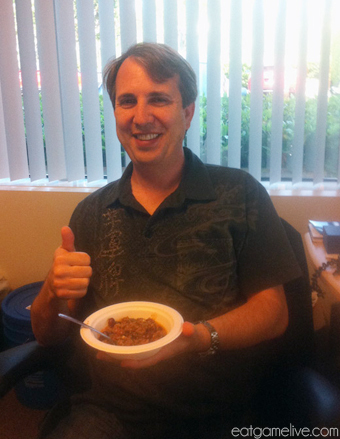 John Hight, Production Director, Diablo III (left), gives a thumbs up for chili. 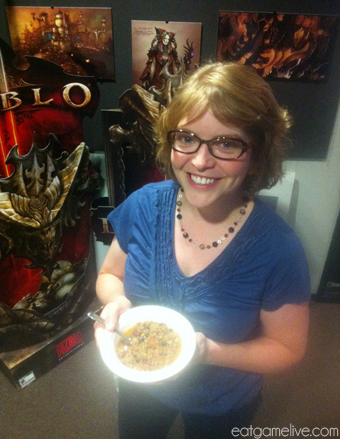 Jill Harrington, Senior Artist, Diablo III, (right) showcases her bowl of chili. I want that Diablo III display stand. I have no idea what I’d do with it though, but that’s OK (all that art in that background would be awesome too!). 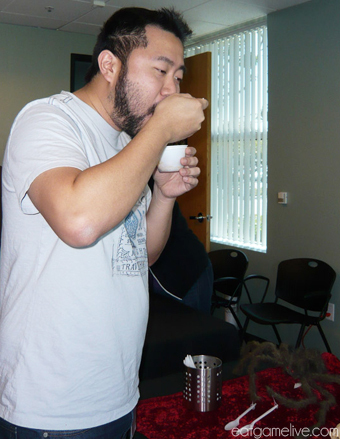 Stephen Chang, Project Manager, eSports, (left) is caught mid-nibble! 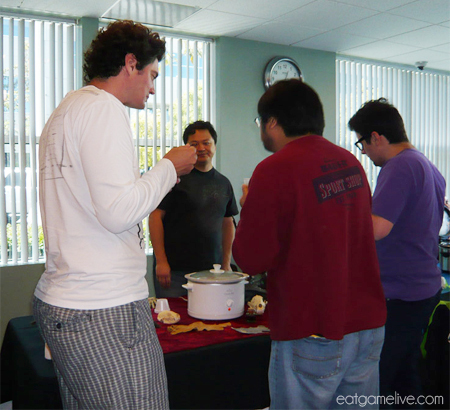 Kaivax, Community Manager, Community Development, (right) sneakily eats chili. (From left to right) Vaeflare, Kevin Martens, and Wyatt Cheng pose next to the awesome table spread. I’d like to give a big thank you to the Diablo III team for suggesting this recipe and major props to Wyatt Cheng for cooking up this recipe! 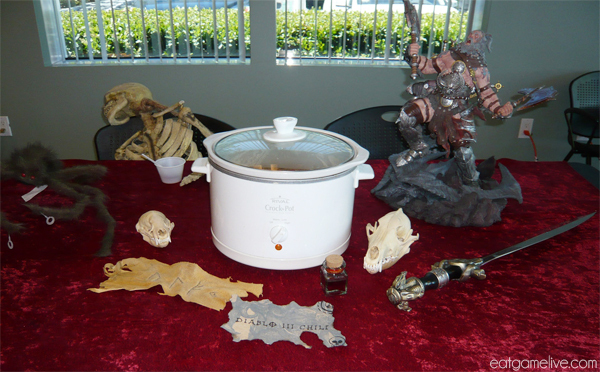 My wonderful former coworker gets a nice shoutout by Blizzard HQ folks with her fine chili! Go Kier! This chili has to be patched and hotfixed for a few months before it was ready. Is that a N7 tech jacket? Not 100% sure, but it does look like one. 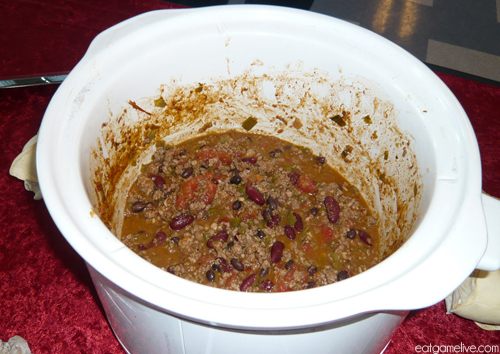 One thing is missing though, a must have for any chili feast….BEER! That looks great, I love chili. but only the mild kind for me! I must say, this recipe is one of the closest to mine I have ever come across. My husband and I love heat in just about anything, so I handle hot peppers almost every day. I have 20 assorted pepper plants in my garden (all but 2 are hot) and I will run out of peppers before next years crop is ready to pick. Anyway, I just want to mention one thing in regards to your warning, a solution of 1 part bleach to 5 parts water will remove the capsaicin oil from your hands, just so you know. Have fun gaming and keep eating healthy. am I allowed to submit a chili dish thats better than this one?